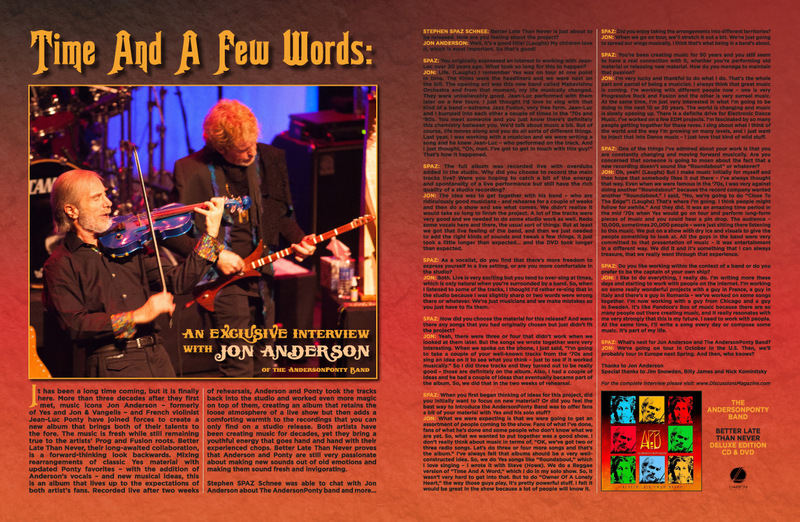 Discussions Magazine Music Blog: JON ANDERSON: The Prog Rock legend talks about The AndersonPonty Band! 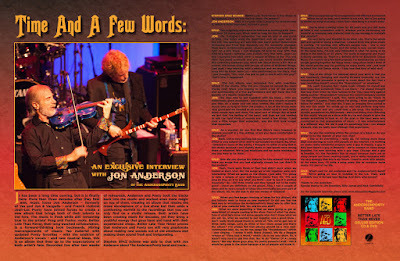 JON ANDERSON: The Prog Rock legend talks about The AndersonPonty Band! It has been a long time coming, but it is finally here. More than three decades after they first met, music icons Jon Anderson – formerly of Yes and Jon & Vangelis – and French violinist Jean-Luc Ponty have joined forces to create a new album that brings both of their talents to the fore. The music is fresh while still remaining true to the artists’ Prog and Fusion roots. Better Late Than Never, their long-awaited collaboration, is a forward-thinking look backwards. Mixing rearrangements of classic Yes material with updated Ponty favorites – with the addition of Anderson’s vocals – and new musical ideas, this is an album that lives up to the expectations of both artist’s fans. Recorded live after two weeks of rehearsals, Anderson and Ponty took the tracks back into the studio and worked even more magic on top of them, creating an album that retains the loose atmosphere of a live show but then adds a comforting warmth to the recordings that you can only find on a studio release. Both artists have been creating music for decades, yet they bring a youthful energy that goes hand and hand with their experienced chops. 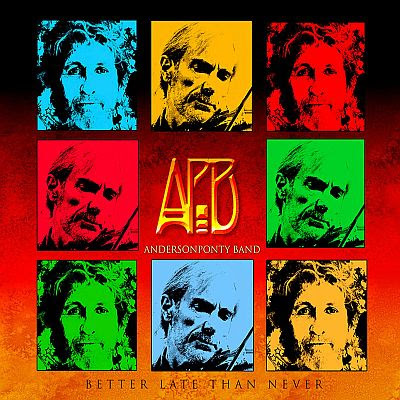 Better Late Than Never proves that Anderson and Ponty are still very passionate about making new sounds out of old emotions and making them sound fresh and invigorating. STEPHEN SPAZ SCHNEE: Better Late Than Never is just about to be released. How are you feeling about the project? JON ANDERSON: Well, it’s a good title! (Laughs) My children love it, which is most important. So that’s good! SPAZ: You originally expressed an interest in working with Jean-Luc over 30 years ago. What took so long for this to happen? JON: Life. (Laughs) I remember Yes was on tour at one point in time. The Kinks were the headliners and we were next on the bill. The opening act was this new band called Mahavishnu Orchestra and from that moment, my life musically changed. They were unbelievably good. Jean-Luc performed with them later on a few tours. I just thought I’d love to sing with that kind of a band – extreme Jazz Fusion, very free form. Jean-Luc and I bumped into each other a couple of times in the ‘70s and ‘80s. You meet someone and you just know there’s definitely this chemistry between you. We’d talk about music a bit. But of course, life moves along and you do all sorts of different things. Last year, I was working with a musician and we were writing a song and he knew Jean-Luc – who performed on the track. And I just thought, “Oh, man. I’ve got to get in touch with this guy!” That’s how it happened. SPAZ: The full album was recorded live with overdubs added in the studio. Why did you choose to record the main tracks live? Were you hoping to catch a bit of the energy and spontaneity of a live performance but still have the rich quality of a studio recording? JON: The idea was to get together with his band – who are ridiculously good musicians – and rehearse for a couple of weeks and then do a show and see what comes. We didn’t realize it would take so long to finish the project. A lot of the tracks were very good and we needed to do some studio work as well. Redo some vocals here and there, the usual sort of things. But at least we got that live feeling of the band, and then we just needed to add the right kinds of sounds and tweak a few things. It just took a little longer than expected… and the DVD took longer than expected. SPAZ: As a vocalist, do you find that there’s more freedom to express yourself in a live setting, or are you more comfortable in the studio? JON: Both. Live is very exciting but you tend to over-sing at times, which is only natural when you’re surrounded by a band. So, when I listened to some of the tracks, I thought I’d rather re-sing that in the studio because I was slightly sharp or two words were wrong there or whatever. We’re just musicians and we make mistakes so you just have to fix them. SPAZ: How did you choose the material for this release? And were there any songs that you had originally chosen but just didn’t fit the project? JON: Yeah, there were three or four that didn’t work when we looked at them later. But the songs we wrote together were very interesting. When we spoke on the phone, I just said, “I’m going to take a couple of your well-known tracks from the ‘70s and sing an idea on it to see what you think – just to see if it worked musically.” So I did three tracks and they turned out to be really good – those are definitely on the album. Also, I had a couple of ideas and he had a couple of ideas that eventually became part of the album. So, we did that in the two weeks of rehearsal. SPAZ: When you first began thinking of ideas for this project, did you initially want to focus on new material? Or did you feel the best way to introduce the Anderson Ponty Band was to offer fans a bit of your material with Yes and his solo stuff? JON: What we were expecting is that we were going to get an assortment of people coming to the show. Fans of what I’ve done, fans of what he’s done and some people who don’t know what we are yet. So, what we wanted to put together was a good show. I don’t really think about music in terms of, “OK, we’ve got two or three radio songs. Let’s do three or four more songs and that’s the album.” I’ve always felt that albums should be a very well-constructed idea. So, we do Yes songs like “Roundabout,” which I love singing – I wrote it with Steve (Howe). We do a Reggae version of “Time And A Word,” which I do in my solo show. So, it wasn’t very hard to get into that. But to do “Owner Of A Lonely Heart,” the way those guys play, it’s pretty powerful stuff. I felt it would be great in the show because a lot of people will know it. SPAZ: Did you enjoy taking the arrangements into different territories? JON: When we go on tour, we’ll stretch it out a bit. We’re just going to spread our wings musically. I think that’s what being in a band’s about. SPAZ: You’re been creating music for 50 years and you still seem to have a real connection with it, whether you’re performing old material or releasing new material. How do you manage to maintain that passion? JON: I’m very lucky and thankful to do what I do. That’s the whole part and parcel of being a musician. I always think that great music is coming. I’m working with different people now – one is very Progressive Rock and Fusion and the other is very surreal music. At the same time, I’m just very interested in what I’m going to be doing in the next 10 or 20 years. The world is changing and music is slowly opening up. There is a definite drive for Electronic Dance Music. I’ve worked on a few EDM projects. I’m fascinated by so many people getting together for these raves. I sing about what I think of the world and the way I’m growing on many levels, and I just want to inject that into Dance music – I just love that kind of wild stuff. SPAZ: One of the things I’ve admired about your work is that you are constantly changing and moving forward musically. Are you concerned that someone is going to moan about the fact that a new recording doesn’t sound like “Roundabout” or whatever? JON: Oh, yeah! (Laughs) But I make music initially for myself and then hope that somebody likes it out there – I’ve always thought that way. Even when we were famous in the ‘70s, I was very against doing another “Roundabout” because the record company wanted another “Roundabout.” I said, “No, we’re going to do “Close To The Edge”! (Laughs) That’s where I’m going. I think people might follow for awhile.” And they did. It was an amazing time period in the mid ‘70s when Yes would go on tour and perform long-form pieces of music and you could hear a pin drop. The audience – 10,000, sometimes 20,000 people – were just sitting there listening to this music. We put on a show with dry ice and visuals to give the people something to look at. All the guys in the band were very committed to that presentation of music – it was entertainment in a different way. We did it and it’s something that I can always treasure, that we really went through that experience. SPAZ: Do you like working within the context of a band or do you prefer to be the captain of your own ship? JON: I like to do everything, I really do. I’m writing more these days and starting to work with people on the internet. I’m working on some really wonderful projects with a guy in France, a guy in Italy and there’s a guy in Romania – we’ve worked on some songs together. I’m now working with a guy from Chicago and a guy in Sweden. It’s like Pandora’s Box of music because there are so many people out there creating music, and it really resonates with me very strongly that this is my future. I need to work with people. At the same time, I’ll write a song every day or compose some music. It’s part of my life. SPAZ: What’s next for Jon Anderson and The AndersonPonty Band? JON: We’re going on tour in October in the U.S. Then, we’ll probably tour in Europe next Spring. And then, who knows?